Trump forced one of his nagging critics, Chris Cillizza, CNN's editor-at-large, to concede the brilliance of the move. 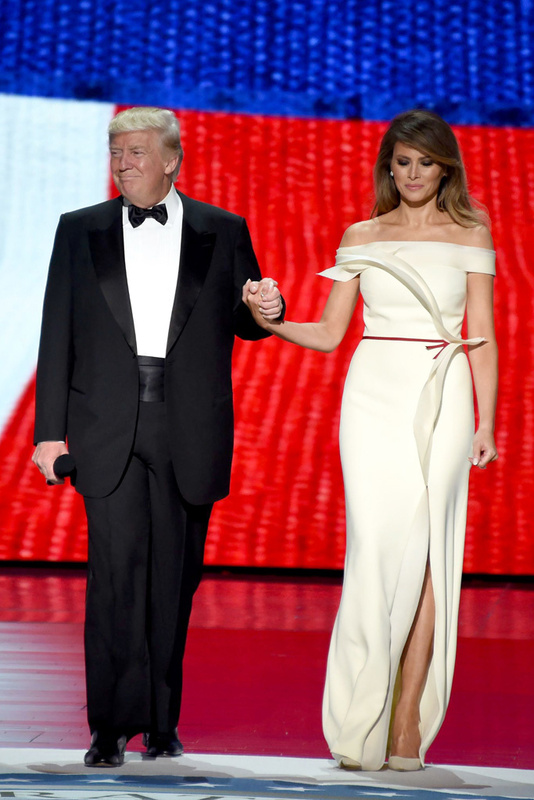 "Perhaps not surprising for someone who has lived his life in the spotlight and who built a life on image and brand, the stagecraft of Trump's first State of the Union was outstanding. 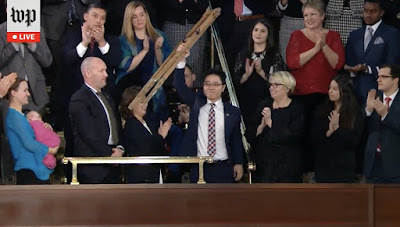 From the families who lost loved ones to the MS-13 gang to Otto Warmbier's parents to the North Korean defector and his crutches, the visuals -- and the stories they told -- were haunting and memorable," Cillizza wrote. 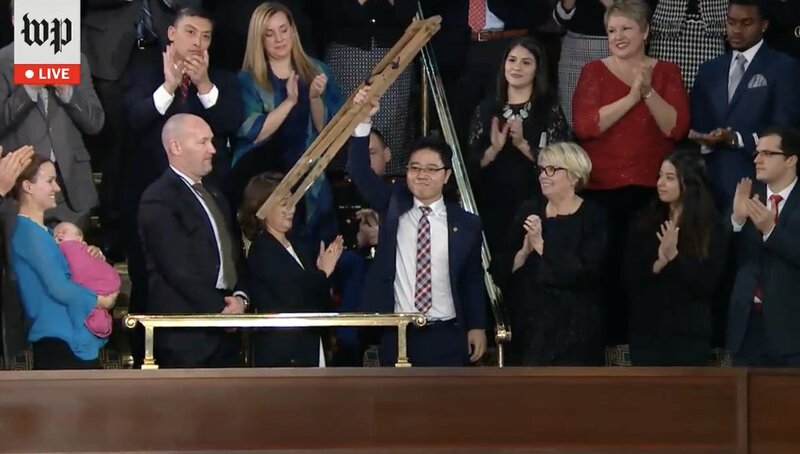 The photograph that won the night was not President Trump, but rather Ji Seong-ho holding his crutches aloft. He escaped North Korea in 2006, and now lives in South Korea helping others escape. 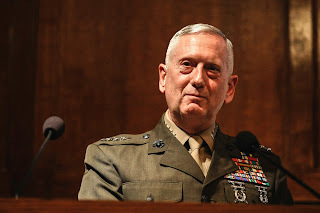 His presence was testimony to the appreciation of President Trump's efforts to confront Kim Jong Un, which may lead to the departure of Kim, and the unification of the two Koreas. Incorporating the victims of MS-13 and the heroes of America made his message theirs. And they are more credible to those who are not as Trumpian as we are. They sold his policies. To be sure, [there] was the co-opting of the Democratic Party line. 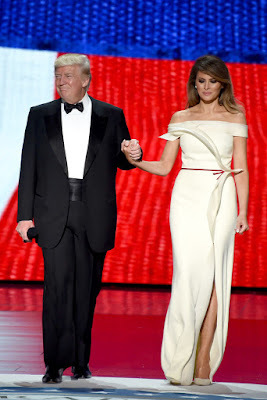 The line of the night was "Americans are Dreamers, too!" For the rest of Don Surber’s SOTU commentary, go here and here. State of the Union and more! 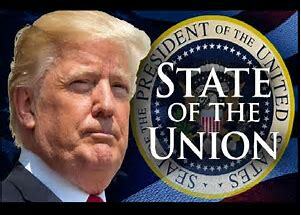 President Donald J. Trump’s first State of the Union address is tonight at 9pm on all major news networks. 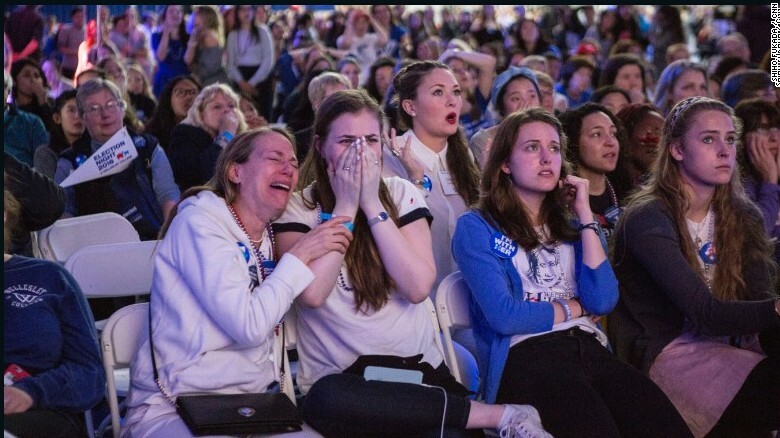 Massachusetts congressman Joseph Kennedy III will present the Democrat party’s official response following the SOTU. a program that is not at present showing up on the Cleveland Spectrum listing. UPDATE: The BET program is on Weds., Jan. 31 at 9pm. 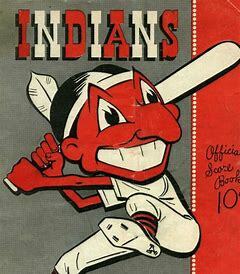 Divisive and hotly debated, the Chief Wahoo logo is being removed from the Cleveland Indians' uniform next year. Yet another casualty of political correctness. I grew up with this logo and am sorry to see it go. PS I always thought choosing a mascot carried with it a compliment. Indians were worthy warriors. Who would want to be cheering for The Cleveland Worms? It’s the moving dictatorship. It’s the tyranny of the network. 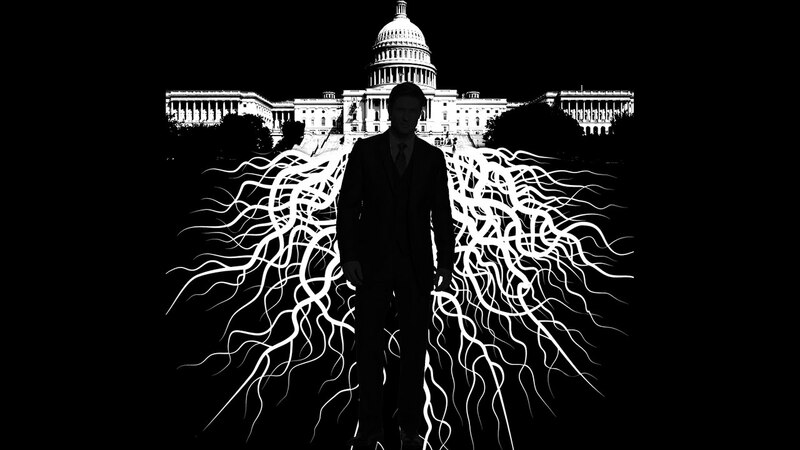 The shadow government is an ideological network. These days it calls itself by a hashtag #Resistance. Under any name, it runs the country. Most of the time we don’t realize that. President Trump has also moved beyond opposing Obamacare and has begun to develop a better system for the future. 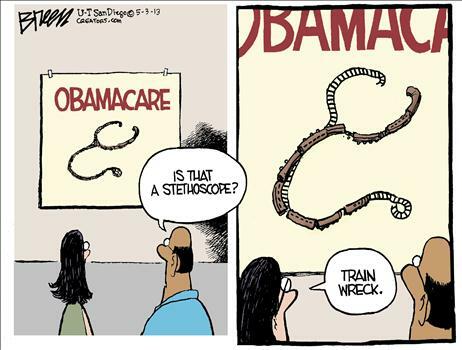 What replaces Obamacare is at least as important as voting to repeal it. Replacing Obamacare requires a lot of specific steps to return to a market-based, decentralized system in 50 different states. The Trump Administration and its Republican allies in Congress have been working diligently in that direction. At the Department of Labor, Secretary Alexander Acosta issued proposed rules which would dramatically expand the availability of Association Health Plans. These plans could be national and regional, allowing for the sale of insurance across state lines, but critically still maintain state autonomy in regulating insurance – which will help police against fraud. Some of the details of the rules may need to be improved to prevent insurance companies from cherry-picking healthy customers, but overall this represents a potentially game-changing reform that could have huge cost saving implications for small business owners and the self-employed. The Trump Administration has also allowed insurers to continue offering “grandmothered” plans created prior to Obamacare, maintaining these lower cost plans for long-time customers. This saved many small businesses and self-employed people a lot of money and anxiety which would have been caused by the Obamacare plan to force them into the government system even if they were happy with their current plan. In addition, the Trump Administration fixed a number of loopholes in the Obamacare enrollment rules, which some customers had been using to game the system to avoid paying their premiums and wait until they got sick to get coverage, by claiming they qualified for a “Special Enrollment Period.” This fraud drove up prices for everyone. The Trump Administration issued new rules that fixed a number of these problems. President Trump also made it easier for people to shop for health insurance without using the Healthcare.gov website. For 2019 enrollment, customers can fully use the insurer websites, as well as aggregators like ehealthinsurance.com. All of this increases convenience, expands choice, and makes lower costs possible. Finally, just last week, Congress enacted a key reform which flew almost completely under the media’s radar. The Continuing Resolution passed to reopen the government this week suspended the health insurance tax for one year, the device tax for two years, and delayed the Cadillac tax until 2022, all of which were part of Obamacare. All of these taxes were simply passed on to patients in the form of higher premiums, so each of these steps will save patients money. BOISE, Idaho (AP) — Concerned about soaring health care costs, Idaho on Wednesday revealed a plan that will allow insurance companies to sell cheap policies that ditch key provisions of the Affordable Care Act. It's believed to be the first state to take formal steps without prior federal approval for creating policies that do not comply with the Obama-era health care law. Health care experts say the move is legally dubious, a concern supported by internal records obtained by The Associated Press. Idaho Department of Insurance Director Dean Cameron said the move is necessary to make cheaper plans available to more people. Otherwise, he said he fears the state's individual health insurance marketplace will eventually collapse as healthy residents choose to go uninsured rather than pay for expensive plans that comply with the federal law. Hope to see more of this. 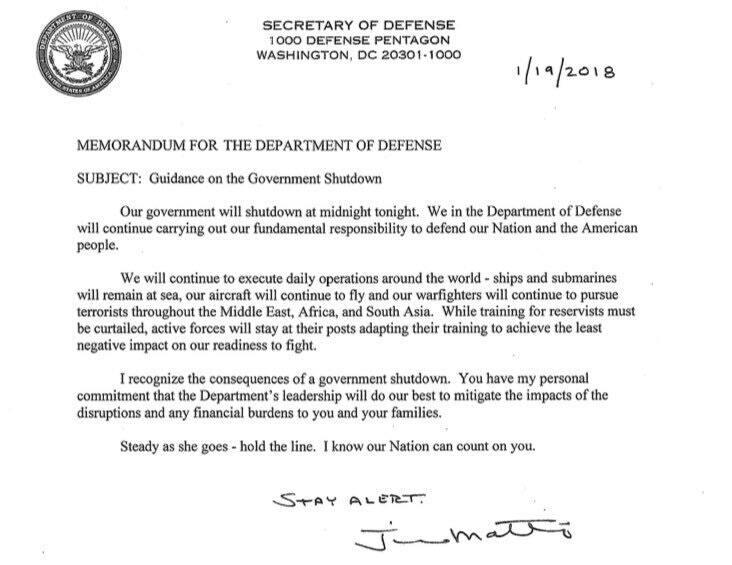 The rest of Newt’s article is here. 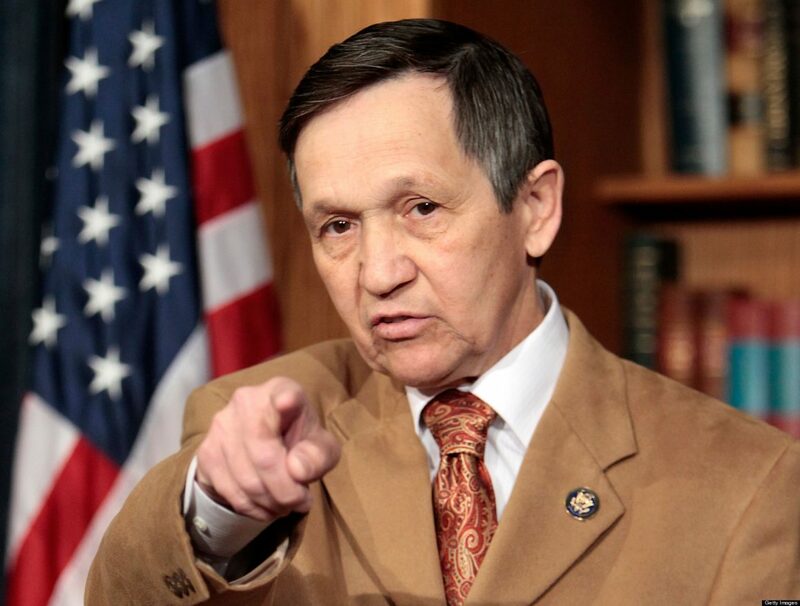 In addition, Kucinich would direct the Ohio State Highway Patrol to stop, inspect, and turn away vehicles found with fracking waste. Sounds like a winning strategy. 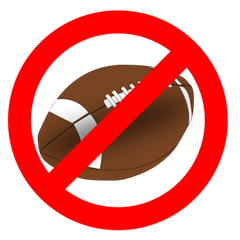 AMVETS officials are decrying "corporate censorship" from the National Football League for their decision not to run an ad in their Super Bowl program which responds to league players’ decision to kneel for the national anthem in protest of national equality issues. The ad, which would have cost the veterans organization $30,000, features the tag "#PleaseStand" with a picture of service members saluting the American flag and information on how to donate to the congressionally-chartered organization. Group leaders said NFL officials refused to include the ad in their Super Bowl publication, but did not issue a reason why. The NFL claims it doesn't permit ads that could be interpreted as making a political statement. Oh, sure, the NFL totally doesn't want political statements during its games. That's why it's permitted a year and a half of National Anthem protests, I guess. Sad to see the American sports culture in self-destruct mode. UPDATE: The Hill reports that former NFL quarterback and Kneeler-in-Chief Colin Kaepernick has been named a finalist for the NFL Players Association 'Community MVP' award. More commentary at Legal Insurrection here. Many of my relatives and friends take pride in their enthusiastic embrace of multiculturalism. I oppose it because it discourages assimilation, and it celebrates cultural differences rather than common values. 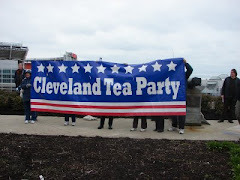 As far as Cleveland Tea Party is concerned, one of the core values, that of limited government, is subverted by uncontrolled immigration that expands the nanny state and dilutes our cultural fabric. The melting pot is giving way to the societal mosaic, more apt to shatter. The argument made by immigration and refugee enthusiasts, namely that the Western democracies were founded and settled by immigrants and therefore should continue to welcome newcomers, is valid only to a point. In the course of time the original settlers created a national identity, a sense of communal membership in a common world unified by custom and law. It is that identity that should be preserved. . . . I am not opposed to immigration per se, only to ill-advised and special interest agendas that would weaken and adulterate the stable domestic accords arrived at over many generations. 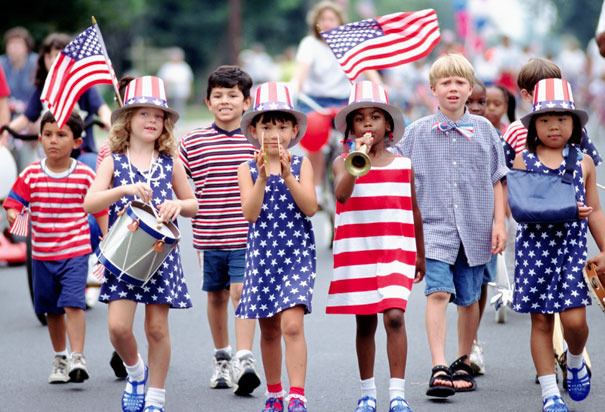 To say “we are a nation of immigrants,” then, is immaterial. We are now a nation of citizens. Skilled immigrants, properly screened and taking into account real domestic needs, should be part of the country’s future, but not in multiples that threaten to dilute a nation’s internal cohesion, not from backward countries whose inhabitants are all too often uneducated, illiterate and functionally unassimilable, and certainly not from parts of the world -- in particular, the Islamic world -- whose history, culture, theology and politics have ranged it against everything that Western civilization comprises. The plight of European nations like Germany, Sweden, England and France, sinking into a morass of civil unrest, criminal violence and legal subversion, should be an incontrovertible object lesson that multiculturalism is the devil’s gift to a forgetful and undeserving people. There is no shame in cherishing and defending one’s “old country” patrimony and the values upon which civic and communal life are founded. This has nothing to do with an antecedent “Eurocentrism” that ostensibly degrades other peoples or with the risible canard of “white supremacy,” but with the sense of belonging to, for all its flaws and errors, the greatest civilization ever to appear on earth, a Judeo-Hellenic-Christian civilization that gave us, among innumerable gifts, the Bible and the Greek library, the magna carta, the concept of individual liberty, scientific and medical advances never before seen, and a technological, commercial and industrial infrastructure that has made life easier for untold millions. Click to embiggen, if necessary. 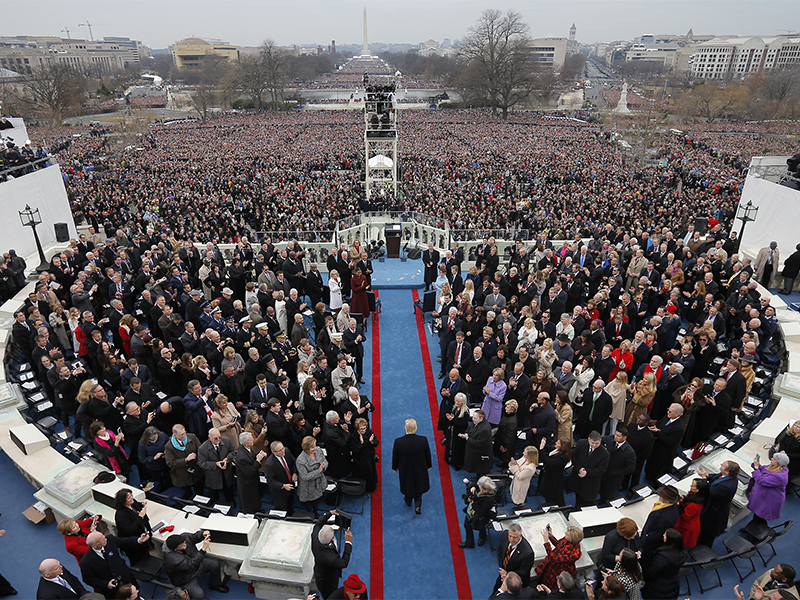 The inauguration of Donald Trump as the 45th President of the United States took place one year ago today. Several hundred thousand people witnessed in person the ceremony held on Friday, January 20, 2017 on the West Front of the United States Capitol Building in Washington, D.C.
President-elect Donald J. Trump was sworn into office by Chief Justice John Roberts, with his hand on two Bibles held by his wife Melania. Wow. We dodged a bullet - perhaps an incoming missile. Mr. Arvay's full article is here. Lots more laughs at the GOP website announcing winners of President Trump's 2017 Fake News Awards, starting with Paul Krugman. Link is here. 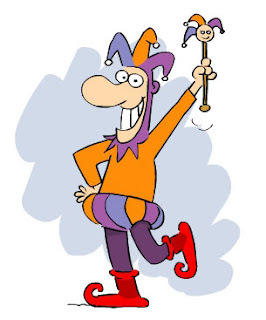 Sparta Report announced its Winners Of The 2017 Fools Of The Year Contest, determined by over 1,000 of their readers. My kind of contest. The big winner is NFL Commissioner Roger Goodell. 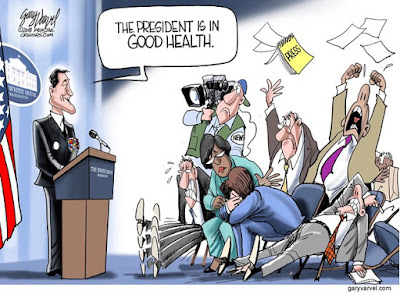 The other winners were CNN’s rudest moron, Jim Acosta (includes video of his arrogant and unprofessional meltdown in front of President Trump and President Nursultan Nazarbayev of Kazakhstan; and Hillary “Felonia von Pantsuit” Clinton. Fun commentary / photos / video are here. The backlash that Pres. Trump has gotten from immigration activists is moving him away from his "I sign anything" stance just days ago. 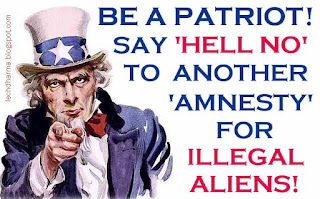 Keep the immigration enforcement/no amnesty calls and social media posts flowing into the White House and US Congress! We're still far from stopping an amnesty let alone any end to chain migration, visa lottery, and funding for border protection. What to say: Ask the President to oppose any illegal alien DREAMER amnesty and to immediately end the unconstitutional DACA program. Need talking points or background before you make your call? The Cleveland Tea Party blog citing Rep. Dave Brat (R-VA) on DACA is here. Our blog citing Mark Steyn, with link to Ann Coulter, both on the priority of stopping illegal immigration, is here. 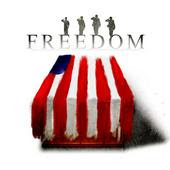 This blog also linked to additional facts and background information about the DREAMers amnesty. Click here. In other words, the Senate proposal is the opposite of the House of Representatives DACA bill -- H.R. 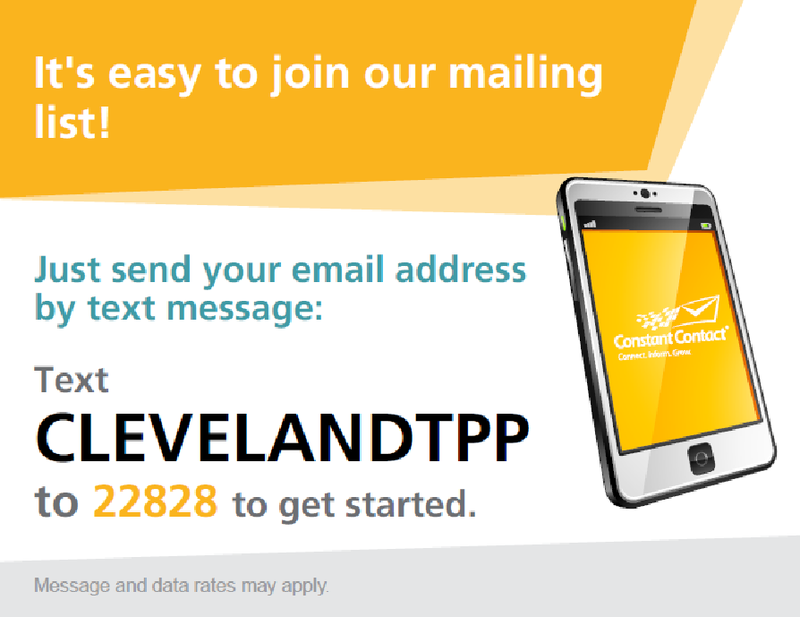 4760 -- that NumbersUSA is endorsing. Your senators need to know that their voters see the so-called balanced senate amnesty deal as a scary joke. Pick one or more numbered items from above that you oppose and tell the Senators' staffers that is why they should make it clear that they want nothing to do with that "Durbin-Flake amnesty proposal" presented to the White House Thursday. 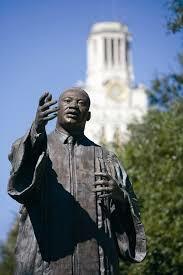 The above pictures monument of Rev Martin Luther King, Jr. is at the University of Texas; it was installed in 1999. It captures the inspiration of the man. Personally, I think to focus on the ethnicity of the man kind of misses the point of Dr. King’s legacy. If the best sculptor doesn’t happen to be black, what of it? Wanting to have it made in America isn’t wrong, however, but let me posit this. If it should be a source of national pride for the Chinese that one of their own made this, then perhaps it will encourage the Chinese to learn more about the man. 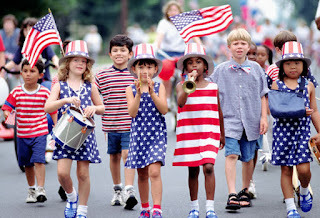 They will learn in his belief in freedom, and equality of opportunity. They will learn of his courage, and he will tell them forthrightly from the grave that it was his faith that gave him that courage. Is that such a bad thing? It seems the Chinese could use some of his philosophy. So my only objection is, well… look at it. It is a frequently misunderstood notion that "modern" and "abstract" art was an organic development that arose from grassroots battles against "oppression" and the "folk art" of the lower classes. In fact, ugly, degenerate art arose from Soviet and communist circles as a means to attack aesthetic beauty. I often remark that "Bauhaus" architecture is communist to the surprise of listeners, but the facts are, "modern art" is almost wholly a communist and Soviet invention of weaponized culture. To understand this, one must look at the Frankfurt School of Marxism, tasked primarily with social engineering and destroying culture. Weaponized culture was a key tool for destroying the West's social values and social structure. This is also true of the modern transformations of "art" into its own internal nihilist critique of meaning itself . . .
It’s in the same family as what Olivia Mull described as “Brutalist buildings” in London. Big, clunky, and just plain ugly. Well, that's my take, anyway. Here’s a link to photos of two dozen monuments to the Reverend. Most of them strike me as a more appropriate tribute to Rev. Martin Luther King than the one in DC. 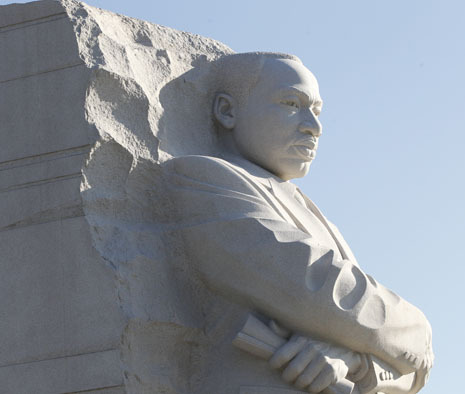 Here's the background on Martin Luther King, Jr. Day. Could the false alarm in Hawaii happen here? NORAD provides airspace surveillance to protect all states in the lower 48, including Ohio. But like Hawaii, Ohio also has its own Emergency Management Agency. 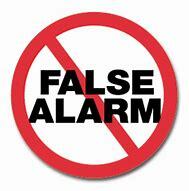 The false alert yesterday that informed Hawaiians a missile was inbound and told for residents to seek shelter was caused by an employee of the Emergency Management Agency pushing "the wrong button" during a shift change. 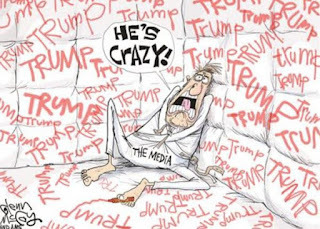 It should be noted that some empty headed leftists are blaming Trump for the SNAFU, but that's just ignorant. The [Hawaii] EMA is wholly a state agency and the responsibility for issuing alerts rests completely with the state government. Today, I have no doubt that the other 49 states in the nation are looking at their notification systems under a microscope. But what should they look for? What happened in Hawaii? Hawaii says the alert was sent out because of a mistake made by an employee. Currently, we have no reason to doubt that explanation. But would Hawaii - or any state - announce to the public that the system had been hacked and the entire EMA system was vulnerable to intrusion? As in, hacked by the Russians? The Ohio EMA Watch Office is one of the newest branches of the agency and is a key component of the state emergency management system. This office aims to help facilitate a quicker, more informed decision-making process for the preparation for, and response to hazards and incidents impacting Ohio. To appreciate what has happened, a little perspective is needed: Mr. Trump’s candidacy was a joke; then he was unelectable, then his election could be invalidated, then he could be impeached, and then he could be removed for past harassment of women, or violating the Logan Act, or obstruction of justice, and now mental incapacity. 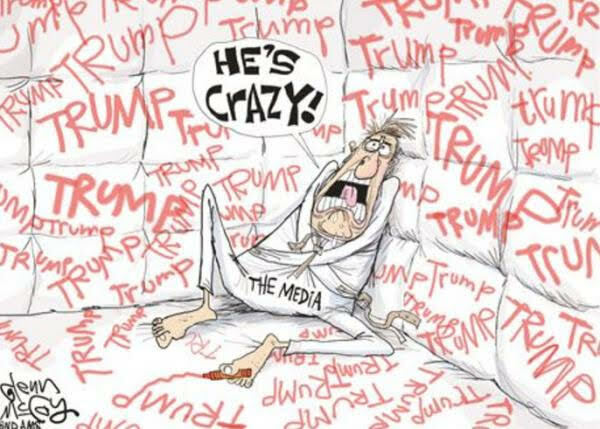 Donald Trump is a strange cat and an acquired taste, but he is one of the most vivid, and one of the most astoundingly successful figures of American history. 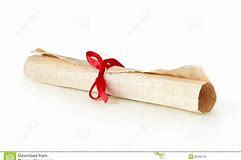 I predict that a year from now, David Brooks and Bret Stephens will be at least closet supporters, even if they have socio-cultural clothespins on their noses. Did Trump even say that bad word?
. . . according to several people briefed on the meeting. 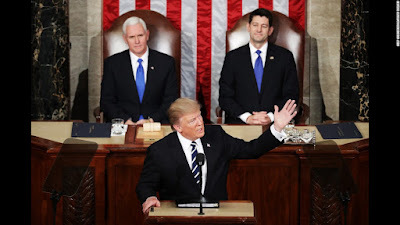 “Why are we having all these people from $#!+hole countries come here?” Trump said, according to these people, referring to countries mentioned by the lawmakers. Take a closer look at Dawsey's construction there. 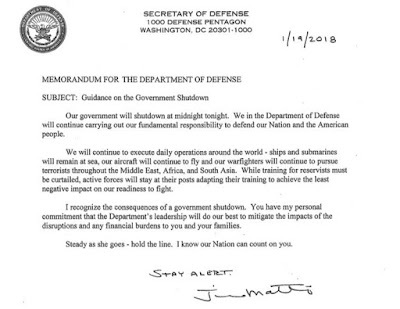 He got this from "several people briefed on the meeting." Oh, okay. So these people, whose names we do not know, were told that Trump said this bad word by somebody who was actually in the room at the time. We're getting it third-hand. So, who are these unnamed people? Any hints? MSNBC's Kyle Griffin gives us one. NBC News has confirmed Trump's "$#!+hole countries" remark with a Democratic aide briefed on the meeting. 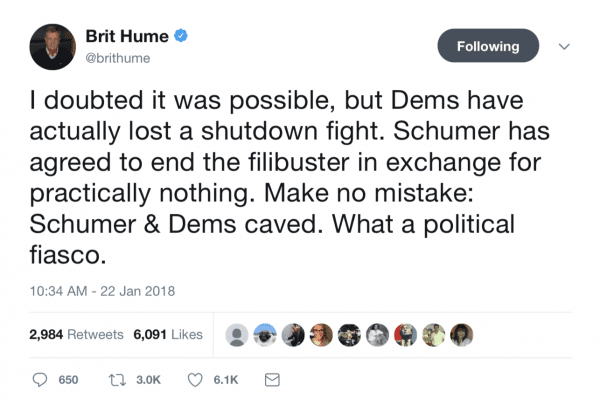 So it's been confirmed by... a Democrat. Who wasn't even in the room. Hey, what more proof do you need? President Trump is a dope? It can happen. Hillary to Trump.